Short Baltic Amber Gemstone Documentary on YouTube!! The ancients looked to the Milky Way for guidance about events here on Earth. Many people still have an intensely personal relationship with their sign & use it as a tool to gather insight about the world around them & the people they encounter in it. For others, not so much. But one doesn’t have to “believe” in astrology to enjoy the fantastic classical artwork featured on Andzia’s new amber horoscope lockets. We are pleased to present for the first time ever all twelve signs of the Zodiac carved into an amber cameo locket using a technique called intaglio. Actually an intaglio is the opposite of a cameo, or camina. A cameo is a positive form sculpted from material such as a seashell & affixed to a gemstone. Intaglio is just the opposite, a negative form, it is created by carefully removing material from the inside of the translucent amber, making a beautiful hollow form that is smooth along the front, but may be felt from behind. 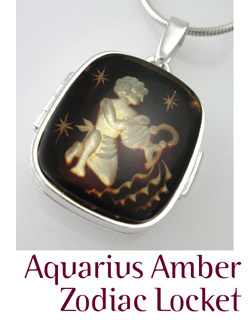 You may view the Zodiac Amber Collection here. These were specially commissioned by Andzia. This is the first time we have been able to offer all twelve of the astrological signs & as if that weren’t wonderful enough, to offer them in a nice, thin rectangle shaped locket. These are limited in quantity. There is a lot to admire in terms of artistry here & one thing we do love about this collection is how wonderfully rendered the figures are, they are not hokey or clumsy, but rather classically inspired in the ancient Greek tradition–truly inspired by the ancient world in an ancient material– amber. 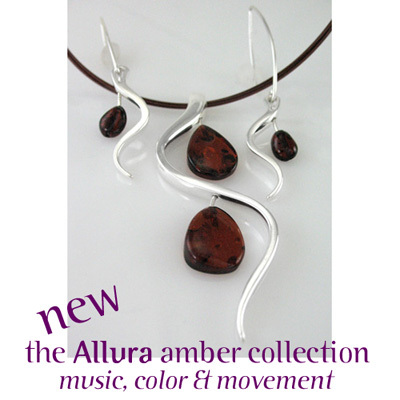 of introducing our new Allura Amber Jewelry Collection. Musical, modern, bead crazy, drenched in rich color & inventive. As you can see, they are designed to move with the wearer. wants to sing. But you know that if you are here. We’re also delighted to share with you a new short film by the International Amber Association, which we’ve posted to andziasamber at YouTube. A brief but fascinating documentary in English and Polish with English subtitles. Reading Room. It’s amazing how much is packed into this little film. distinction each year since 2002 to be a firm recommended by the IAA. our customers, this benefit is passed on to you. something to be genuinely excited about! And there is this very cool New Jersey Amber video we found which is also really fun in our youtube favorites… check it out! offer may not be combined with any other promotion. special offer from Andzia, please sign up for our newsletter list so you don’t miss the next one. your account. One per customer please.